Volume depletion takes place when fluid is lost from the extracellular space at a rate exceeding net intake. Acute hemorrhage is the leading cause of acute life-threatening intravascular volume loss requiring aggressive fluid resuscitation to maintain tissue perfusion until the underlying cause can be corrected. Intravascular volume depletions may also result from gastrointestinal disorders (eg, vomiting, diarrhea, or ascites), burns, environmental exposure, or renal salt wasting. Volume depletion may result from acute sequestration in the body in a “third space” that is not in equilibrium with the intracellular fluid, as seen in septic shock. When volume loss occurs, the body reacts by triggering a wide range of physiologic regulatory responses to maintain perfusion in the vascular beds of the most important organs, namely the heart, brain, and kidneys. Decreases in circulating blood volume lead to a drop in arterial blood pressure, and diminished venous return reduces preload, stroke volume, and, therefore, cardiac output. This stimulates aortic baroreceptors, cardiac stretch receptors, and the sympathetic nervous system to increase ventricular contractility, venous and arterial vasoconstriction, and fluid shifts into the intravascular system. The kidneys react through the rennin-angiotensin-aldosterone system by retaining sodium and water and releasing antidiuretic hormone to increase intravascular volume. The coagulation system responds through the release of local mediators such as thromboxane and platelet-aggregating factor and controls sites of bleeding through vasoconstriction, platelet plug formation, and fibrin deposition. Without adequate fluid resuscitation, tissue hypoperfusion leads to lactate production and metabolic acidosis. Once the physiologic response to hypovolemia is overwhelmed by prolonged tissue hypoxia, myocardial contractility is depressed and hypoxia and acidosis result in the loss of peripheral vasoconstriction, release of inflammatory mediators and activation of cellular apoptotic pathways, eventually leading to death. The normal circulating volume of an averaged-size adult is approximately 5 L for a 70 kg person, or 7% of body weight. This volume is further divided into 3 L plasma and 2 L RBC volume (see the image below). Disturbances between the intravascular and extravascular volumes or acute blood loss are all indications for fluid resuscitation. 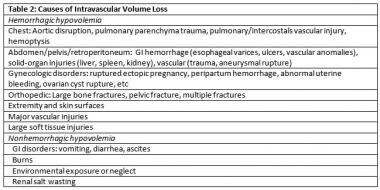 The image below lists the various types of intravascular volume loss. Assessment of the need for fluid resuscitation begins with the clinical history. If significant volume loss is reported, volume resuscitation is likely required regardless of laboratory findings or relatively normal vital signs. Signs of orthostatic or persistent hypotension should prompt the provider to begin resuscitation as well. Skin: The skin is cool and clammy, except in the cases of septic shock or a “warm shock” in which patients may be febrile. Skin tenting (loss of skin turgor) and dry mucous membranes may be present. Cardiac: Tachycardia becomes more pronounced with increasing volume loss. Renal: Acute renal failure with decreased urine output. Extremities: Weak and faint pulses, slow capillary refill, and muscle weakness may be present. Neurological: Early findings include altered mental status exhibited by restlessness, agitation, or general CNS depression. Later findings include more severe CNS depression, seizure, obtundation, or coma. Vascular access and monitoring are essential for proper volume resuscitation. Establish IV access early with awareness that the rate at which crystalloid can be infused is dependent on the catheter diameter and the driving pressure. Large bore peripheral IVs may be as adequate for volume resuscitation as central lines. Maintaining vascular access above the diaphragm is important if concern exists regarding vascular injury in the abdomen or pelvis. For adults and especially children, an intraosseous (IO) line may be placed in the distal femur or proximal tibia within 90 seconds for a truly unstable patient with inadequate peripheral access. Initial fluid resuscitation is generally accepted to begin with the infusion of crystalloids. If no acceptable hemodynamic improvement occurs after 2-3 L infusion of crystalloids in patients with shock, a blood transfusion may be needed. In the setting of massive hemorrhage, beginning blood transfusion immediately is appropriate. For children, an initial fluid bolus of 20 mL/kg of crystalloids over 0-20 minutes may be repeated twice, followed by a transfusion of 10 mL/kg warm pack red blood cells (PRBCs) if the patient remains unstable. A review published in 2007 summarized the data from studies that evaluated the use of premedication to decrease the incidence of febrile nonhemolytic transfusion reactions. The authors concluded that no evidence supports the use of premedication with antihistamines and/or acetaminophen for the prevention of these reactions. A blood warmer should be used when transfusion of more than 3 units of blood at one time to avoid the complications of hypothermia. Although blood collections are now routinely separated into various components, allowing for the storage of RBC up to 42 days,  avoiding transfusion-related hyperkalemia may be minimized by using blood that was collected less than 5 days prior to transfusion. An alternative is to wash stored red with saline to remove extracellular potassium. These options may not be available in the acute setting. Each unit of packed red blood cells PRBC has a volume of 300 mL and contains about 200 mL of red blood cells, which should raise the hemoglobin by about 1 g/dL or the hematocrit by 3-4% in the setting of controlled or slow bleeding. The ultimate outcome measure is mortality. Adequate volume resuscitation should lead to stabilization of vital signs and the ability of the body to recover from whatever insult is the etiology of the need for volume. Please see the Monitoring and Follow-Up section for what should be monitored during resuscitation. These are interim outcome measures to follow. Hinds CJ, Watson D. ABC of intensive care: circulatory support. BMJ. 1999 Jun 26. 318(7200):1749-52. [Medline]. [Full Text]. Zengin S, Al B, Genc S, et al. Role of inferior vena cava and right ventricular diameter in assessment of volume status: a comparative study: ultrasound and hypovolemia. Am J Emerg Med. 2013 May. 31(5):763-7. [Medline]. Bickell WH, Wall MJ Jr, Pepe PE, Martin RR, Ginger VF, Allen MK, et al. Immediate versus delayed fluid resuscitation for hypotensive patients with penetrating torso injuries. N Engl J Med. 1994 Oct 27. 331(17):1105-9. [Medline]. Stern SA. Low-volume fluid resuscitation for presumed hemorrhagic shock: helpful or harmful?. Curr Opin Crit Care. 2001 Dec. 7(6):422-30. [Medline]. Reilly PM, Wilkins KB, Fuh KC, Haglund U, Bulkley GB. The mesenteric hemodynamic response to circulatory shock: an overview. Shock. 2001 May. 15(5):329-43. [Medline]. Maslanka K, Uhrynowska M, Lopacz P, et al. Analysis of leucocyte antibodies, cytokines, lysophospholipids and cell microparticles in blood components implicated in post-transfusion reactions with dyspnoea. Vox Sang. 2014 Aug 18. [Medline]. Peters AL, van Hezel ME, Juffermans NP, Vlaar AP. Pathogenesis of non-antibody mediated transfusion-related acute lung injury from bench to bedside. Blood Rev. 2014 Sep 20. [Medline]. Stack G, Judge JV, Snyder EL. Febrile and non-immune transfusion reactions. Rossi EC, Simon TL, Moss GS, Gould SA. Principles of Transfusion Medicine. Philadelphia: Williams and Wilkins; 1996. p778. Weiskopf RB. Do we know when to transfuse red cells to treat acute anemia?. Transfusion. 1998 Jun. 38(6):517-21. [Medline]. Sirchia G, Rebulla P, Parravicini A, Carnelli V, Gianotti GA, Bertolini F. Leukocyte depletion of red cell units at the bedside by transfusion through a new filter. Transfusion. 1987 Sep-Oct. 27(5):402-5. [Medline]. Sanchez R, Lee TH, Wen L, Montalvo L, Schechterly C, Colvin C, et al. Absence of transfusion-associated microchimerism in pediatric and adult recipients of leukoreduced and gamma-irradiated blood components. Transfusion. 2011 Oct 7. [Medline]. Stainsby D, MacLennan S, Thomas D, Isaac J, Hamilton PJ. Guidelines on the management of massive blood loss. Br J Haematol. 2006 Dec. 135(5):634-41. [Medline]. Goldflam K, Saul T, Lewiss R. Focus On: Inferior Vena Cava Ultrasound. ACEP News. June 2011. [Full Text]. van Haren F, Zacharowski K. What's new in volume therapy in the intensive care unit?. Best Pract Res Clin Anaesthesiol. Sept 2014. 28(3):275-83. [Medline]. Goodnough LT. Transfusion triggers. Surgery. 2007 Oct. 142(4 Suppl):S67-70. [Medline]. Practice Guidelines for blood component therapy: A report by the American Society of Anesthesiologists Task Force on Blood Component Therapy. Anesthesiology. 1996 Mar. 84(3):732-47. [Medline]. Informed consent, parental permission, and assent in pediatric practice. Committee on Bioethics, American Academy of Pediatrics. Pediatrics. 1995 Feb. 95(2):314-7. [Medline]. Högman CF, Meryman HT. Red blood cells intended for transfusion: quality criteria revisited. Transfusion. 2006 Jan. 46(1):137-42. [Medline]. Roberts I, Blackhall K, Alderson P, Bunn F, Schierhout G. Human albumin solution for resuscitation and volume expansion in critically ill patients. Cochrane Database Syst Rev. 2011 Nov 9. 11:CD001208. [Medline]. Perel P, Roberts I. Colloids versus crystalloids for fluid resuscitation in critically ill patients. Cochrane Database Syst Rev. 2011 Mar 16. CD000567. [Medline]. Bunn F, Trivedi D, Ashraf S. Colloid solutions for fluid resuscitation. Cochrane Database Syst Rev. 2008 Jan 23. CD001319. [Medline]. Raghunathan K, Shaw AD, Bagshaw SM. Fluids are drugs: type, dose and toxicity. Curr Opin Crit Care. August 2013. 19(4):290-8. [Medline]. Bulger EM, May S, Kerby JD, Emerson S, Stiell IG, Schreiber MA, et al. Out-of-hospital hypertonic resuscitation after traumatic hypovolemic shock: a randomized, placebo controlled trial. Ann Surg. 2011 Mar. 253(3):431-41. [Medline]. [Full Text]. Finfer S, Bellomo R, Boyce N, French J, Myburgh J, Norton R. A comparison of albumin and saline for fluid resuscitation in the intensive care unit. N Engl J Med. 2004 May 27. 350(22):2247-56. [Medline]. Eastman AL, Minei JP. Comparison of Hemoglobin-based oxygen carriers to stored human red blood cells. Crit Care Clin. 2009 Apr. 25(2):303-10, Table of Contents. [Medline]. Jahr JS, Walker V, Manoochehri K. Blood substitutes as pharmacotherapies in clinical practice. Curr Opin Anaesthesiol. 2007 Aug. 20(4):325-30. [Medline]. Cohn CS, Cushing MM. Oxygen therapeutics: perfluorocarbons and blood substitute safety. Crit Care Clin. 2009 Apr. 25(2):399-414, Table of Contents. [Medline]. Roberts I, Shakur H, Coats T, Hunt B, Balogun E, Barnetson L, et al. The CRASH-2 trial: a randomised controlled trial and economic evaluation of the effects oftranexamic acid on death, vascular occlusive events and transfusion requirement in bleeding trauma patients. Health Technol Assess. March 2013. 17(10):1-79. [Medline].